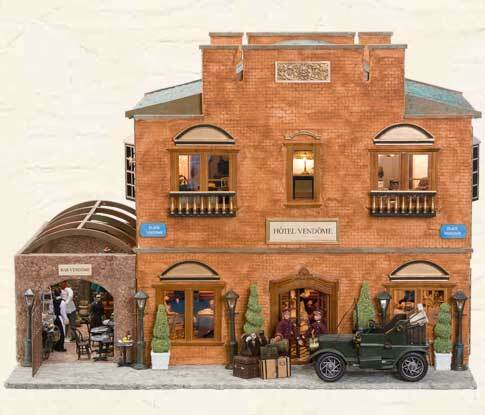 This architectural miniature was featured on the cover of "Dolls House and Miniature Scene" in October 2012 (issue #220). The building shell is 3/8" birch plywood. The exterior walls and cobblestone street are paper clay, textured and painted with different washes and colors. Suze created the copper patina on the roof using copper metallic paint and a patina antiquing solution. All the lights and chandeliers work, and are controlled by exterior switches. The art deco floor in the restaurant was glued into place one tiny piece at a time by hand, and took over twenty hours to complete. The historic Hôtel Vendôme was built in Paris in 1723 by Pierre Perrin, and was by turns a private residence and a seat of government. In 1842 it became the embassy of the young Republic of Texas, whose independence France was the first to recognize. Three centuries of art, culture and elegance make it a unique address in Paris. The Vendôme is currently a five star hotel. Suze mixed inspirations from a variety of sources in this piece. The exterior is based on the building in Johannes Vermeer's painting "The Little Street". The building Vermeer depicts wasn't the kind of luxurious townhouse inhabited by the privileged elite, but a residence for modest townfolk, so Suze incorporated an opulent interior inspired by the Ritz. Knowing that she was planning to build a hotel, Suze had been collecting items over the years--Louis Vuitton luggage, Cartier jewelery and display cases, accessories, leopard/animal print furniture, bellboys and an exquisite solid oak bar. The restaurant/lobby area was designed around this bar, whose arches provided inspiration for the arched entryway to the courtyard, courtyard skylight, hotel roof and window details. Of note also are the mini Cartier boutique in the corner of the lobby, and the card rack containing miniatures of Suze's own line of Eiffel tower greeting cards. So, welcome to the Hôtel Vendôme! We have "coffee time" serving chocolates and pastries until late in the evening. Weary shoppers can take a break around teatime, or have a martini to start off the evening in the bar/brasserie. Customers may also be served in the courtyard. Please make yourselves at home.